Today’s mini-adventure was caused by the Caltrain that stopped running after work from about 5pm. So I waited an hour after work and left at 7pm. I was hoping it would be resolved by then. I happened to bump into some colleagues from work also waiting at the Caltrain station. 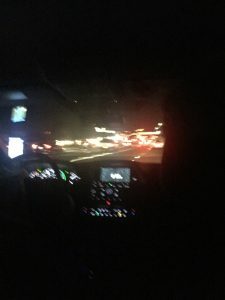 After waiting about 20mins, we decided to get an Uber ride back to San Francisco. I had the ride pass discount, so the total cost worked out to be $45 (after the $13 discount was applied). Split 3 ways, it became $15 each. So the $12 ride pass which I bought yesterday has already saved me $14. Winning! There’s still 26 days left. We effectively took a 1 hour road trip. Which is cool when you’re with friends so the ride doesn’t seem as long. My commute everyday during the work week is 2 hours. 10mins to walk to the station, wait a few mins for the train if I’ve timed it right, then 45mins on the train, then walk across the street to the office. Its roughly one hour door to door. But sometimes its longer due to delays. So I’m considering moving to South Bay so I can cut down on my commute time. I’d save two hours or more every day. 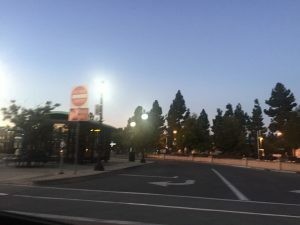 It seems like every 1.5 months, there’s a Caltrain breakdown and it cost you hours. If I live in somewhere like Sunnyvale I could be at work with a 5 min drive, 10 min bike ride or a 25min walk. I’ve also got my drivers license test in a few weeks too! If I move to South Bay, I’m getting a car because that’s the only way to get around. Tim Tam’s Were A Hit! 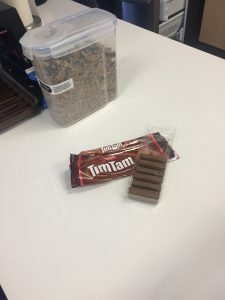 I brought some some tim tams from Australia to the office to share with my team. I have to admit the fancy Messina Black Forest tim tams are rubbish but the original one is . For lunch, I caught up with a friend for lunch that I’d been helping with product manager interviews. He ended up getting a job at a tech company nearby. So we went out to celebrate by eating some Middle Eastern food. 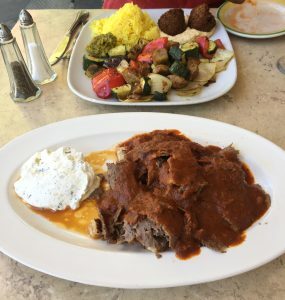 I had an open lamb kebab with this red sauce and white cream which was really tasty. I’ve also been busy because I started a Facebook group called “BayBargain” which is for people that live in the Bay Area that want to save money so we can spend money on the things that we want. Living in the Bay Area is one of the most expensive locations in the USA (if not the world!). In the group, we talk about credit card rewards, budgeting, discounts, credit history and more! If you’re interested, ping me. I’m looking forward to tomorrow which is Shipit, a 24 hour work hackathon! I’ll be working on night mode for mobile apps. I quite like using night mode for reading apps. Plus my fitbit broke today. 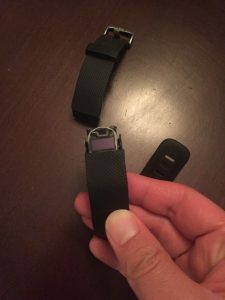 Its a sign that I need to get the new apple watch 3! The Caltrain also costs about $200/month to travel between several zones.